If just the thought of sleeping on grass or a cot makes your back ache, then glamour camping may be just what you’re looking for. 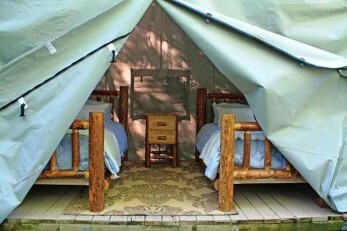 Our glamour camping accommodations (aka glamping) are the perfect way to enjoy the outdoors without ‘roughing it’. You’ll be able to relax in these glamour tents which come furnished with mattresses so you can get a good night sleep, waking up refreshed and ready to go. You must reserve one of these tents early though, as they tend to go quick every year! 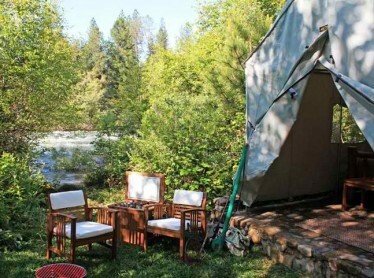 Containing two twin-sized beds, these glamour cabins can comfortably accommodate 2 people. Available for only $100 per night, glamour cabins are truly a unique experience! 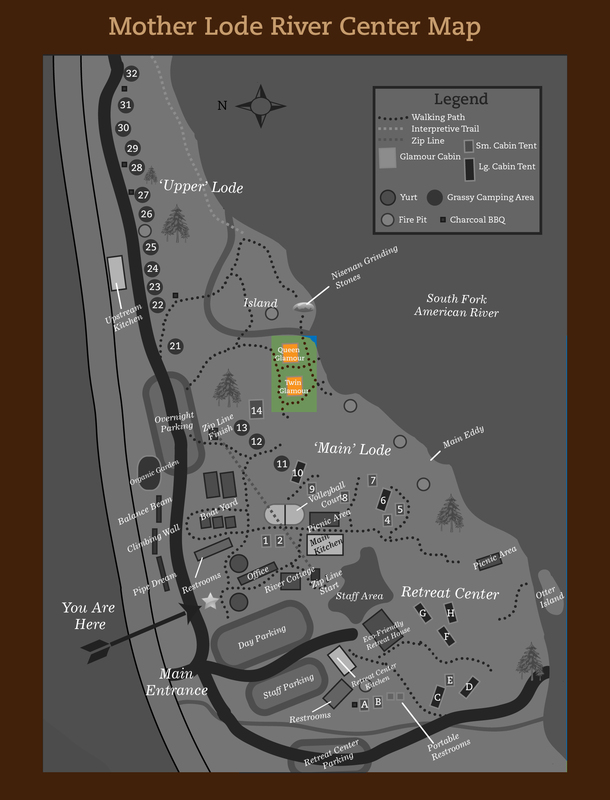 *You must have reservations for one of our programs (whitewater rafting, ropes course, outdoor education) to book accommodations. Where are they located on the facility? If you are interested in reserving a glamour cabin, check out their relative location to the restroom facilities, main kitchen and more! Click on the image to enlarge. Would you prefer to stay indoors? We have several additional accommodations for those who would prefer to sleep inside. When renting the glamour cabins, you do not need to worry about anything – we will provide the pillows, blankets and linens. Relax and enjoy your glamorous experience! There are a few important guidelines we’d like you to be aware of while using the facility.